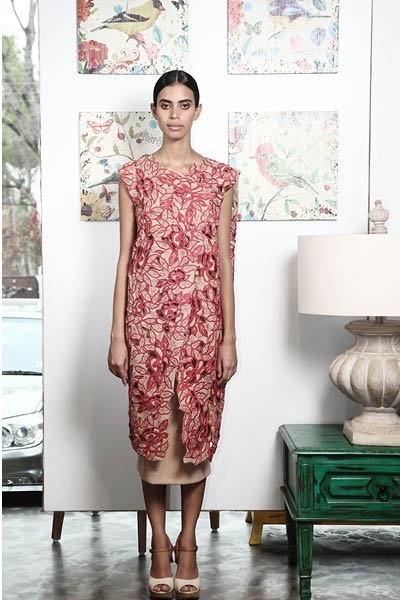 Archana Rao’s label Frou Frou has firmly established a name and niche for itself amongst the fashion romantics. Picking up where she left last season, Archana continued her pastel play with pearl detailing and embroidered cut work for Spring Summer 2015. Diving into the sea of vintage Parisian charm she resurrected the era with regal nuances. Her collection titled ‘The Apartment’ saw a mélange of soft hues starting with nudes, blush pinks, pearly whites that transitioned into strong shades like military green and ochré. Archana’s ability to evoke nostalgia through her clothes, her clever juxtaposition of ethereal fabrics with strong silhouettes, and deliverance of authentic trends season after season, has turned her into a promising label on our fashion radar, even as she looks forward to the launch of her flagship store in Hyderabad.